Been wanting to explore the wildlife and nature? Do not miss this budget safari tour package, as you will get the opportunity to spot both wildlife, bird species, and wildflowers. 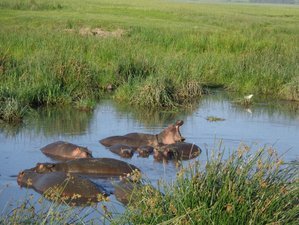 Moreover, you will be visiting some of the well-known parks such as Tarangire National Park, Serengeti National Park, Ngorongoro Crater, along with other cultural tour. Wait no more, sign up now to have an encounter with the big five animals. During this safari tour, you will be traveling to several places. Hence, you will be staying at four different accommodation throughout the safari tour. This accommodation is located 2.1 kilometers from the centre of Arusha, it is comfortable and affordable to guests visiting this part of Tanzania. The available facilities onsite includes satellite TV, restaurant, and parking on premises. Fanaka is located in Mto wa Mbu township, it is 130 kilometers from Arusha city on main road to Ngorongoro, and to Serengeti National Parks. This is a budgeted campsite, the camping area is secluded, spacious, and under shade of trees. This is one of the most famed campsites in Tanzania for animal encounters. It is located in the Central Serengeti area known as Seronera. Moreover, there will be nocturnal animals passing through the campsite during the night. The facilities available at the campsite include hot showers, bathrooms, solar powered electricity, and eating area. Ngorongoro Simba is a huge public campsite set on the crater rim. It is situated on the south-western rim of the Ngorongoro Crater Rim and about two kilometers away from the crater village. The campsite has well-maintained toilets, regularly attended, hot water showers that are heated by wood fires, and firewood for sale. Moreover, there are wild animals from the crater, Serengeti, as well as the Ngorongoro Conservation Area frequently visit the campsite which is not fenced; you should move with caution. We are going to pick you from your place of arrival (airpot or bus station) to your ready booked Venice hotel for overnight. Dream about your national park safari adventure tomorrow. Warmly welcome. In addition, the park's natural vegetation consists mainly of acacia woodland, giant African monster baobab trees, and huge swamp areas. Moreover, both the river and the swamps act like a magnet for the local wildlife during the dry season in Tanzania. After a pleasant picnic lunch, the group will continue game drive eastwards to visit another spectacular setting of Tanzania's wildlife, which is the famous Ngorongoro Crater. After breakfast, the group will descend to Ngorongoro Crater floor for game drive. From the crater, you will be able to see a setting of jaw-dropping beauty such as the world's largest volcanic caldera, full of grassland, forest, and swamp. After breakfast we take you to airport as well. We are kindly looking for you back again with friends and family. This safari tour will be happening in Tanzania, you will be visiting several places such as Tarangire National Park, Serengeti National Park, and Ngorongoro Crater Rim. Tarangire is the sixth largest national park in Tanzania, it is located in Manyara Region. The name of the park is originates from the Tarangire River that crosses the park. Moreover, Serengeti National Park is located in northern Tanzania. The park is well-known for its massive annual migration of wildebeest and zebra. The Ngorongoro crater rim is also located in northern Tanzania. The crater is one of the most impressive wildlife areas in Africa and it has been designated as a World Heritage Site. During the safari tour, you will be served with four breakfasts, two lunches, and two dinners, as well as a cup coffee. Moreover, you will be given a complimentary bottle of drinking water during the tour. During the safari, there are two optional value added services available. That includes visiting the Olduvai Gorge to explore the footprints and skull of Homo habilis. Also, to visit the Maasai cultural espying in the bush villages. Please book your flights to arrive at Kilimanjaro International Airport (JRO) or Arusha Airport (ARK). Transfer from and to this airport is included. Rhino Explorer Tours & Safaris will pick you up at the airport.